The picture above shows the Apollo 13 Service Module after it was released from the Command Module and set adrift in space about 4 hours before re-entry of the CM into the Earth's atmosphere. "There's one whole side of that spacecraft missing", Jim Lovell said as the Apollo 13 astronauts got their first view of the damage that had been caused by the explosion. This blurry photo taken by the astronauts shows the extent of the injury to the Apollo 13 spacecraft, which exposed most of the inside of the service module to space. The Service Module was towed all the way back to Earth after the explosion in order to protect the Command Module heat shield. Another view is shown below. The Apollo 13 malfunction was caused by an explosion and rupture of oxygen tank no. 2 in the service module. The explosion ruptured a line or damaged a valve in the no. 1 oxygen tank, causing it to lose oxygen rapidly. The service module bay no.4 cover was blown off. All oxygen stores were lost within about 3 hours, along with loss of water, electrical power, and use of the propulsion system. The oxygen tanks were highly insulated spherical tanks which held a "slush" of liquid oxygen with a fill line and heater running down the center. The no. 2 oxygen tank used in Apollo 13 (North American Rockwell; serial number 10024X-TA0008) had originally been installed in Apollo 10. It was removed from Apollo 10 for modification and during the extraction was dropped 2 inches, slightly jarring an internal fill line. The tank was replaced with another for Apollo 10, and the exterior inspected. The internal fill line was not known to be damaged, and this tank was later installed in Apollo 13. During pre-flight testing, tank no. 2 showed anomalies and would not empty correctly, possibly due to the damaged fill line. (On the ground, the tanks were emptied by forcing oxygen gas into the tank and forcing the liquid oxygen out, in space there was no need to empty the tanks.) The heaters in the tanks were normally used for very short periods to heat the interior slightly, increasing the pressure to keep the oxygen flowing. It was decided to use the heater to "boil off" the excess oxygen, requiring 8 hours of 65 volt DC power. This probably damaged the thermostatically controlled switches on the heater, designed for only 28 volts. It is believed the switches welded shut, allowing the temperature within the tank to rise to over 1000 degrees F. The gauges measuring the temperature inside the tank were designed to measure only to 80 F, so the extreme heating was not noticed. The high temperature emptied the tank, but also resulted in serious damage to the teflon insulation on the electrical wires to the power fans within the tank. 56 hours into the mission, at about 03:06 UT on 14 April 1970 (10:06 PM, April 13 EST), the power fans were turned on within the tank for the third "cryo-stir" of the mission, a procedure to stir the oxygen slush inside the tank which would tend to stratify. The exposed fan wires shorted and the teflon insulation caught fire in the pure oxygen environment. This fire rapidly heated and increased the pressure of the oxygen inside the tank, and may have spread along the wires to the electrical conduit in the side of the tank, which weakened and ruptured under the pressure, causing the no. 2 oxygen tank to explode. This damaged the no. 1 tank and parts of the interior of the service module and blew off the bay no. 4 cover. The sketches above are taken from the NASA book "Apollo Expeditions to the Moon", NASA SP-350. 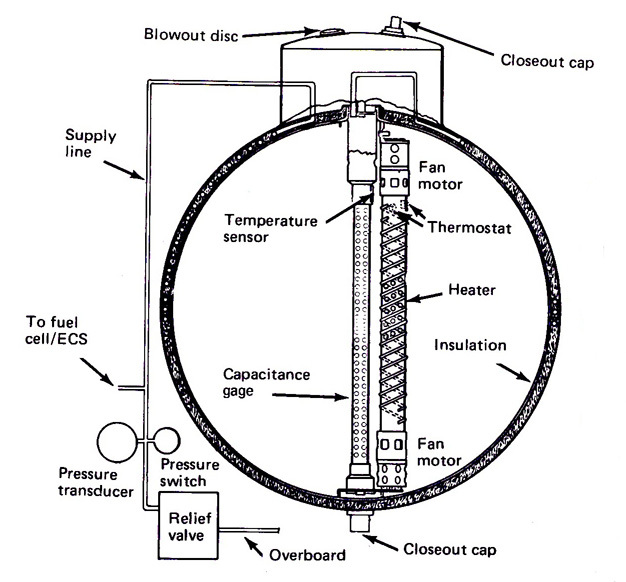 The top diagram shows the details of oxygen tank number 2 and the heater and thermostat unit. 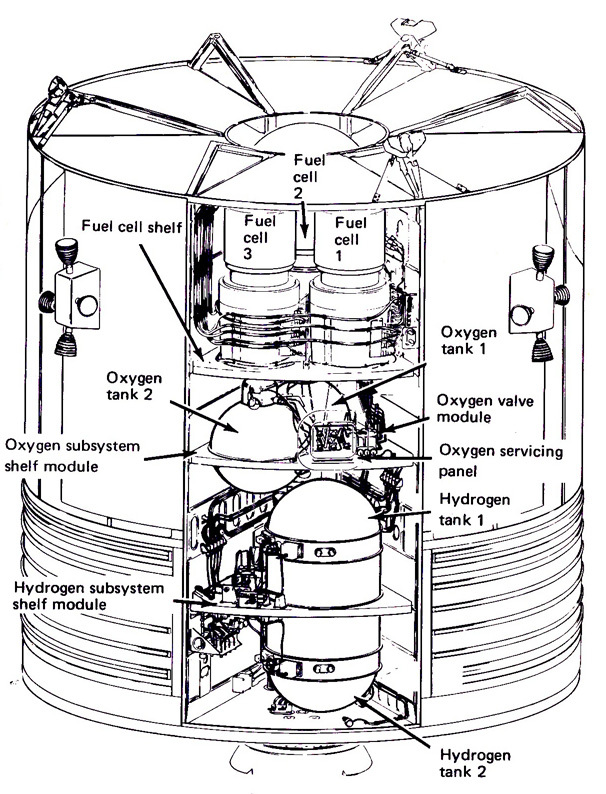 The lower picture shows the Apollo 13 Service Module and the location of the oxygen tanks relative to the other systems. Below is another view of the damaged service module taken from the Command Module after separation. Detailed chronology of events - A description of events from 2 and a half minutes before the accident to 5 minutes after. Report of Apollo 13 Review Board - Highly detailed information on the accident. Apollo 13 Mission - chapter from the online book "Apollo Expeditions to the Moon"
A Fragile Lifeboat - "Moonport: A History of Apollo Launch Facilities and Operations"